By coincidence, two different issues about free markets and roads came up this morning. I'd like to cover them both. The idea here is that, were it not for public snow removal, snow would not be removed at all. There are, of course, a number of problems with this meme. First of all, it isn't true: I won't deign to link you to the dozens of news stories about people who voluntarily shovel or plow snow from public roads, but the stories do exist. Second of all, the scene in the picture above likely depicts a public road. 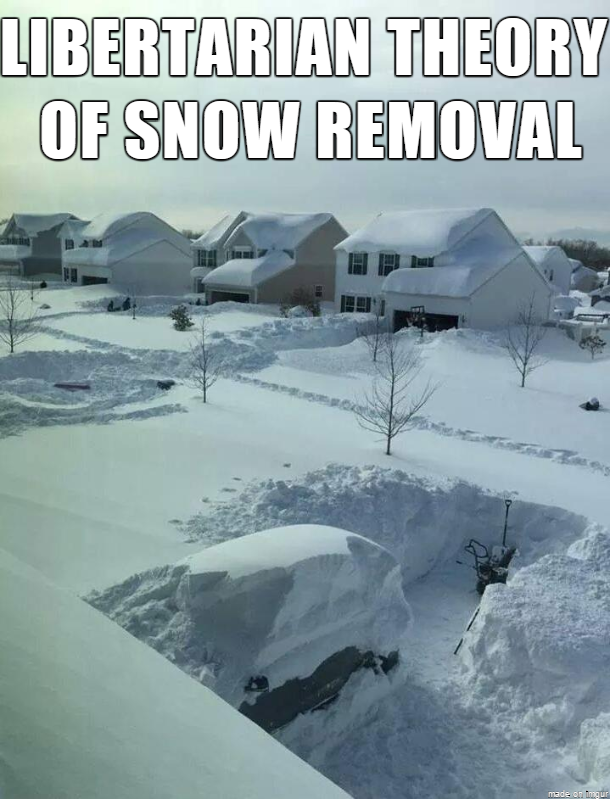 What you're seeing is probably the result of socialized snow removal, not capitalism. Third of all, notice that the citizens in the picture are disincentivized from plowing more than their own personal driveways because they now believe that the public street is "the government's responsibility," even though leaving it to government is probably even less convenient for those who need to use the street. Fourth, many municipalities already use the libertarian solution: private snow plow contractors, who compete with each other to plow the roads. Even scary socialist Canada does this. But so what? It's just a joke. I had to laugh at how so many libertarians "responded" in social media to what is obviously just a joke. Jokes aren't knock-down arguments for ideology, they're jokes. Maybe I'm the only libertarian who got a chuckle out of this. The other thing I laughed about what the fact that no one I know on social media pointed out the real problem with public snow removal: It's wasteful. A good number of people who live on that street don't need to drive to work at all. They can telecommute. Telecommuting is the real, emergent, anarcho-capitalist, libertarian solution to snow removal, because it represents the spontaneous order of a solution to the real problem with snow: getting somewhere. This solution is not the one that planners and leftists "expect" to see from being snowed in. They point to libertarianism as being impracticable because, to them, the problem is "snow on the streets." But the only problem capitalism sees is "I can't get to work." And capitalism has already solved that problem. Naturally, this isn't true for everyone who lives on that street, but it's true for a significant, non-zero number of them. Thus, any amount of money those people have to spend - via taxes - on snow removal is a total deadweight loss for them. The city is "over-spending" on snow removal by removing some snow that need not be removed. That's the "trick" to understanding free markets: First, you have to be able to see beyond the obvious - it's not a snow problem, it's a get to work problem. Second, you have to be able to see marginal costs - while plowing everything might benefit many, it is also wasteful for many others. Stalled motorists, as far as the eye can see. The cause was neither a traffic incident nor any other unexpected event. It was the result of road construction on the highway, which has been going on in this same area for the past three years. You can ask "but who will build the roads?" but the thing is, building a road isn't free. In fact, the cost of building a road isn't just the taxpayer money that gets transferred to the contractors who build the roads, plus the cost of government administration and oversight thereof. It's also the additional cost of increased traffic incidents suffered by motorists - including deaths. It's the cost of additional law enforcement and traffic enforcement over the region. And, it's the cost of sitting in traffic, burning gasoline in an idle vehicle, for an extra thirty minutes every day, multiplied by tens of thousands of motorists. It's impossible to provide an accurate accounting of these costs, but if you consider that the roads themselves cost millions to build and maintain, and the hit to local GDP is many more millions lost to the factors listed above, and I haven't even provided an exhaustive list of such expenditures, then the problem starts to present itself in clearer terms. One possible market solution? Telecommuting. Another? Flying cars - which, by the way, largely haven't happened due to the regulatory burden involved in getting them to market and up into the skies.